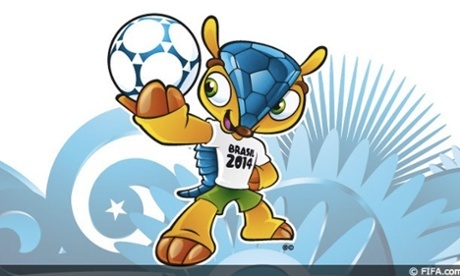 Brazil 2014’s official mascot is Fuleco the three-banded armadillo, but critics say that organisers are not doing enough to use this high-profile status to promote its protection in the wild. Fuleco is the official mascot of Brazil 2014. Image courtesy of fifa.com via The Guardian. Back in 2012, FIFA and Brazilian organisers revealed the identity of the official mascot for the Brazil 2014 World Cup: Fuleco the armadillo, based on the tatu bola (“armadillo ball” or three-banded armadillo), a creature endemic to Brazil. The tatu bola was chosen not only because of its similarity in appearance to a football when it curls up to protect itself from predators, but also with the hope that its status as one of the most visible emblems of this massive global football tournament would serve to highlight its fate as an endangered species. 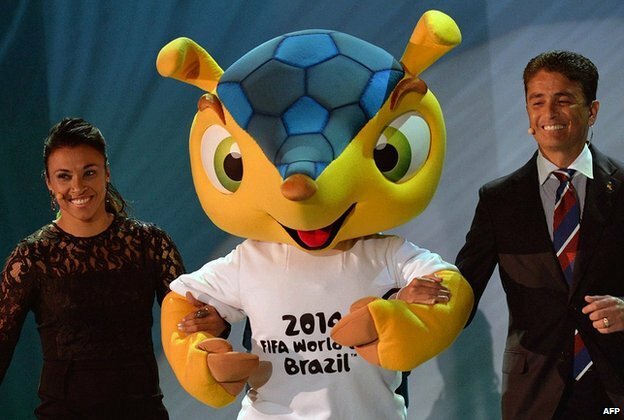 Taking its name from a mixture of the Portuguese words for football (futebol) and ecology (ecologia), Fuleco’s designation as the World Cup’s official mascot was described at the time by FIFA secretary-general Jerome Valcke as “very fitting”, given the focus that the tournament’s organisers wanted to put on environmental and ecological issues. With the tournament now underway, and with Fuleco having become a household name among Brazilians, FIFA claims that it has “helped to raise awareness in Brazil around the three-banded armadillo and its status as a vulnerable species”. Yet what is apparent so far is that, while Fuleco has established himself as a lucrative revenue source for the World Cup’s organisers, with millions of cuddly toys and other associated merchandise, the real-life animal and its traditional Caatinga habitat have been largely ignored by organisers and fans alike. FIFA and Brazilian officials are coming in for sharp criticism from conservationists and environmentalists, who claim that they have failed thus far to live up to their promises of using Fuleco’s stint in the spotlight as a means of guaranteeing the protection of the tatu bola in the wild. 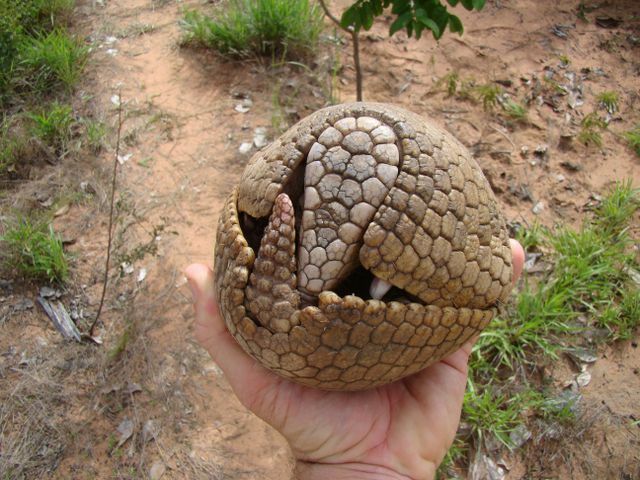 The three-banded armadillo, or tatu bola, is known for its ability to curl itself up into a tight ball in order to protect itself from predators. Photo courtesy of the Associação Caatinga via IPS News. The tatu bola, which has long been listed as a “vulnerable” species, has seen its population decline by about 30% over the last 10 to 15 years. According to some experts, the Brazilian government is expected to change the armadillo’s status to “at risk of extinction” within the next year. “This means that if nothing is done, the animal could be extinct in the next 50 years”, says Flávia Miranda, a Brazilian biologist who has also worked as a consultant to the Associação Caatinga (Caatinga Association), an NGO dedicated to the protection of the tatu bola. The factor said to carry the most blame for the tatu bola’s recent decline is the reduction in size of its natural habitat, the Caatinga dry forest uplands of north-eastern Brazil, also home to four of the twelve host cities of this year’s World Cup: Salvador, Recife, Natal, and Fortaleza. Once covering 11% of Brazilian territory, the Caatinga has retreated to less than half of its original size due to deforestation, the encroachment of industrial-sized agricultural and cattle-ranching estates, and the impacts of climate change on rainfall and vegetation patterns. In addition to the loss of its habitat, the tatu bola is also threatened by hunting activities carried out by local communities, while some experts even fear that the extra publicity that Fuleco is providing for his species could prove counter-productive, with people wanting to adopt the tatu bola as domestic pets. “People see it as a cute animal because it rolls itself up into a ball”, says Mariella Superina from the International Union for Conservation of Nature (IUCN). “We are worried that people will want them as pets; they are definitely not pets”. The tatu bola is named after its ability to roll up into a ball, and it was this quality that inspired its adoption as the World Cup mascot. Photo courtesy of IPS News. With the rise of Fuleco to World Cup fame having failed to alleviate conservationists’ fears over the longer-term survival of the tatu bola, concerned sectors are now calling on the tournament’s organisers to do something – quickly – about the lack of protection afforded to Brazil’s latest global symbol. In what has come to be an influential article, published in April in the journal Biotropica, a team of Brazilian scientists outlining the World Cup’s potential to leave a positive environmental legacy has called on FIFA and Brazilian officials to pledge the protection of 1,000 hectares of Caatinga for every goal scored during the month-long competition. Based on the average trend from previous World Cups, this could amount to around 170 goals over the 64 games – resulting in 170,000 hectares receiving official “protected area” status from the Brazilian government (although this figure could be substantially higher if the goal-packed action of the early games continues!). While this would represent barely 0.2% of the total Caatinga area, it would at least be a start, and a positive gesture towards recognising the need to protect the tatu bola and its habitat, which would also – naturally – benefit many other species inhabiting the country’s north-eastern ecosystems. It would also raise the possibility of reversing a worrying trend, whereby FIFA and its sponsors have reaped the financial rewards of marketing Fuleco without showing any inclination towards repaying the tatu bola by guaranteeing its protection. On the eve of the tournament, there had reportedly been just one donation from official World Cup sponsors, and even this amounted to 100,000 reais (US$45,000), a petty amount when compared to the vast amount of money being spent on the tournament as a whole. Rodrigo Castro, who heads the Associação Caatinga, argues that a small percentage of Fuleco soft toy sales (some of which are priced at up to US$15) should go towards conservation efforts for the tatu bola and Caatinga. Additionally, the Biotropica article’s authors urge FIFA and the Brazilian government to draw from the FIFA World Cup Legacy Trust – a multi-million fund which aims to promote community development in Brazil once the World Cup juggernaut has moved on – in order to ensure the survival of the tatu bola and its habitat. Fuleco may be proving a hit, but critics claim that FIFA haven’t done enough to ensure the wellbeing of the tatu bola in the wild. Photo courtesy of AFP via the BBC. However, with the tournament now in full flow, conservationists remain confident that Fuleco’s long-term legacy will be a positive one when it comes to the protection of his species, and there have been encouraging signs from the Brazilian government that it is prepared to listen to the concerns of conservationists who had previously criticised it. On 22 May, the Environment Ministry unveiled a five-year National Action Plan for the Conservation of the Tatu Bola, which it had elaborated alongside the Associação Caatinga. According to Castro, the plan includes “the creation of new protected areas, better monitoring to reduce deforestation, environmental education programs to reduce hunting and more research about the distribution and behaviour of the species, about which little is known at the moment”. Perhaps more pertinently, Enrico Bernard, one of the Biotropica article’s co-authors, argues that the article put pressure on the government to publish the details of the plan, which it had been working on already for some time. This should provide encouragement for supporters of the tatu bola to keep up their pressure on the powers that be to ensure a proper World Cup legacy for this precious species, even if the benefits of Fuleco’s status as official mascot have, so far, been few and far between. 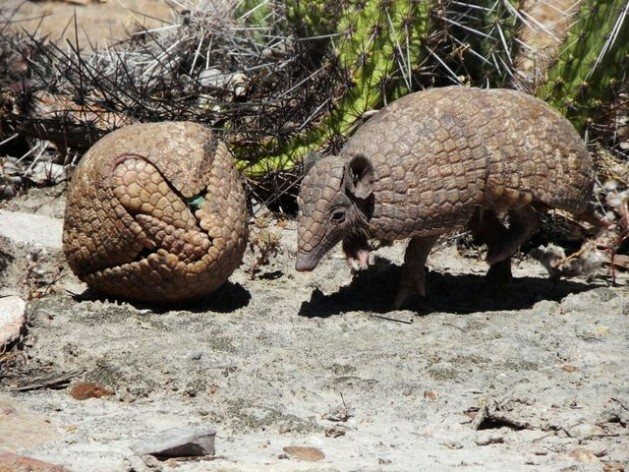 “The Brazilian three-banded armadillo gave life to Fuleco, but Fuleco has achieved very little for the three-banded armadillo”, Rodrigo Castro claims in comments to the BBC. “We hope that millions of people watching the matches will become aware of the plight of this animal and that the World Cup will have an impact on the fate of the species. The outcome depends to a great extent on FIFA. We still hope it will understand this is the first ever World Cup that could leave a lasting legacy for biodiversity, helping to save the Brazilian three-banded armadillo from extinction”.